"It was really weird the way it happened, man, but it was really inspired, Half Baked." Film buffs and students flock to Bravo's Inside the Actor's Studio as it explores the inner workings of a particular actor or director's career. There's no middle ground when it comes to the host, James Lipton. People find him either charming or egotistic or ingratiating—I adore him and all of his quirks. Getting the likes of Paul Newman, Robert Redford, and other cinematic legends to reflect candidly on their careers is impressive, but without Lipton's wit and crazy questions, Bravo's cornerstone series wouldn't be so successful. Comedian Dave Chappelle recently grace this coveted stage, and Shout Factory Home Video has seen fit to devote an entire DVD to this unforgettable episode, following on the heels of Chappelle's public controversy. I'm happy to report that Chappelle's rabid fan base will be very glad they did. It begins with a great new introduction from Lipton in which he muses about Chappelle's hometown of Yellow Springs, Ohio (a mere 10-minute drive from my house), and the events leading up to his late arrival for the show's taping. He talks about how the comedian insisted on paying for his own flight to New York (the show is a non-profit entity) and how the audience waited for nearly nine hours as the late guest of honor had travel troubles. Lipton also discloses that Norman Lear and Dustin Hoffman were so impressed by this episode that they called him a few days after it aired and eventually called Chappelle as well. This is a great addition, with Lipton giving a heart-felt monologue on how this particular session effected him as well. The program then begins, presented in its original broadcast format, meaning that Chappelle's colorful language is still bleeped out on this disc. This is a small complaint though, as this is 90 minutes of comedic and surprisingly genuine storytelling bliss. Everything you want to know about Chappelle's life is unearthed by Lipton, who does his typical shtick but lets the comedian take center stage. We get the perfect blend of Lipton interview skills and classic clips of the comedian in action. There's plenty of footage from Chappelle's Show, but the discussion following clips from The Nutty Professor, Half Baked, and Block Party are particularly engaging. The most interesting section of the program involves Dave's sabbatical in Africa following his highly publicized disagreement with Comedy Central over his comedy series. This segment accomplishes two things in that it brings out the terrifically sincere side of Chappelle, and establishes him as deeply thoughtful with a firm grip on society's numerous problems. He goes into surprising detail about the split with the network that became a media feast, appearing disappointed in their dealings with him yet gracious in his gratitude for the opportunities he was given. Inside the Actor's Studio always features a question and answer session with the student-dominated audience, and this one is among the best you'll see. Chappelle fields their queries as if he were talking to close friends. He doesn't shy away from any subject, regardless of how controversial or bizarre it might be, giving his audience exactly what they're looking for. Of course, Lipton's patented questions don't disappoint either, but they can't top Dave's intimate rapport with the audience. It's too bad all of the reported three hours of footage shot are not included, but the 90 minutes we do have offer a hint of what a magical night this must have been. Image Transfer Review: The image is what would be expect from a TV show shot in a college theater. The image is very sharp and nicely detailed, aided in large part by excellent shadow and contrast levels. The color scheme is also far from dynamic, but the theater's lighting holds up well and fleshtones are very accurate. A bit of grain pops up, but this is kept to a bare minimum. Audio Transfer Review: The Dolby Digital 2.0 sound mix is also identical to its broadcast counterpart. The film and TV show clips work just fine, utilizing the rear speakers during the few instances they're called upon. Extras Review: The only extra is a good one. Great Moments That Didn't Make the Cut is a collection of six deleted scenes that last around 13 minutes. Of the clips, the best tale involves Chappelle, Russell Simmons, Def Comedy Jam, and a pair of sneakers. 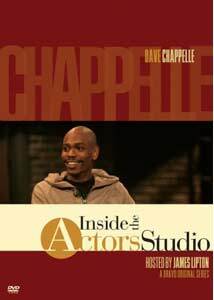 After a lull in which the series has featured some questionable interviewees, Inside the Actor's Studio returns to form in 2006, thanks in large part to a special evening with comedian Dave Chappelle. Shout Factory's new DVD is nothing flashy, but it does give us the show in all of its original broadcast glory, and even throws in a few deleted segments along with a new informative introduction by James Lipton.